You are here: Home / General Crafts / DIY Unicorn Ribbon Ring Decor – So Cute! DIY Unicorn Ribbon Ring Decor – So Cute! You’ll have everyone saying, “Awwww, how cute!” about this DIY unicorn ribbon ring! It’s quick and easy to make and looks great in any space because it’s 100% customized to any decor. Unicorn lovers will absolutely adore this! Do you know a unicorn lover? We have a couple in our house which is why you’ll find quite a few unicorn topics here on Ruffles and Rain Boots. 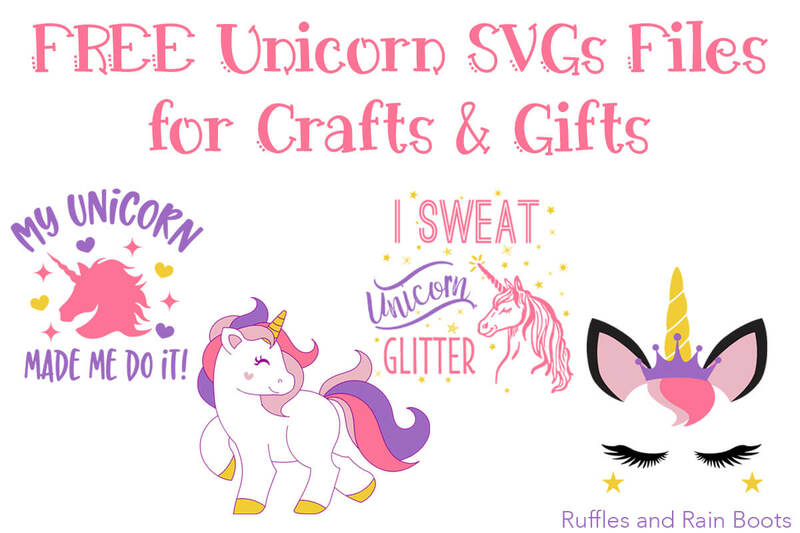 Before you read any further, you might like to also check out our FREE unicorn clipart for parties, invitations, etc. –we are no stranger to anything unicorn around here. 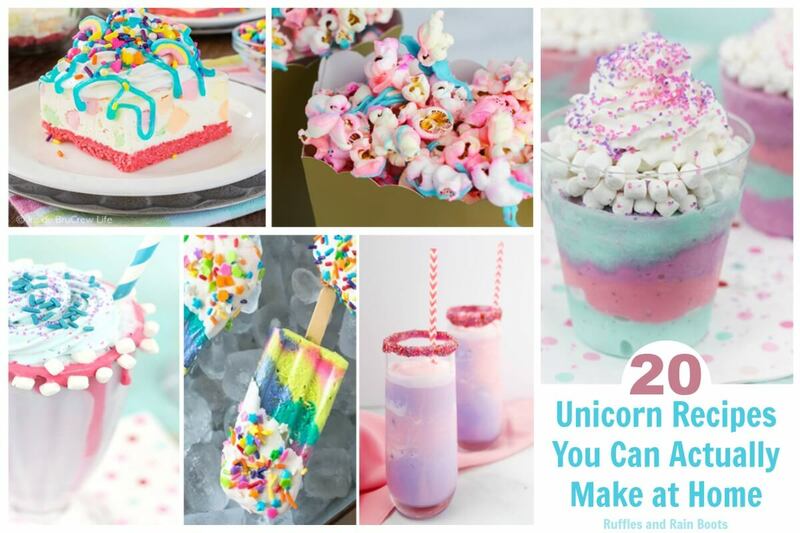 Related Reading: The Best Unicorn Recipes You Can Actually Make at Home! 1. Create a paper cone. Create a paper cone by rolling a corner of the glitter cardstock. This might be tricky depending on the thickness of your cardstock, but work with it. Trim off the rest of the cardstock beyond the cone and use hot glue to secure (you might have to hold it a bit until it sets). Trim the bottom so that it is level-ish (it doesn’t have to be perfect) and make any trims or glue adjustments to the tip (if you need to). Set it aside. 2. Ears. Cut two ear shapes from the non-glitter cardstock. Note: if I had to do this again, I would have also cut a light pink inset for the ear. Put them aside for now. 3. Ribbon ring. Once the ribbon lengths are ready (remember to vary the size), tie them in knots at the bottom of the hoop. 1. Attach the cone. 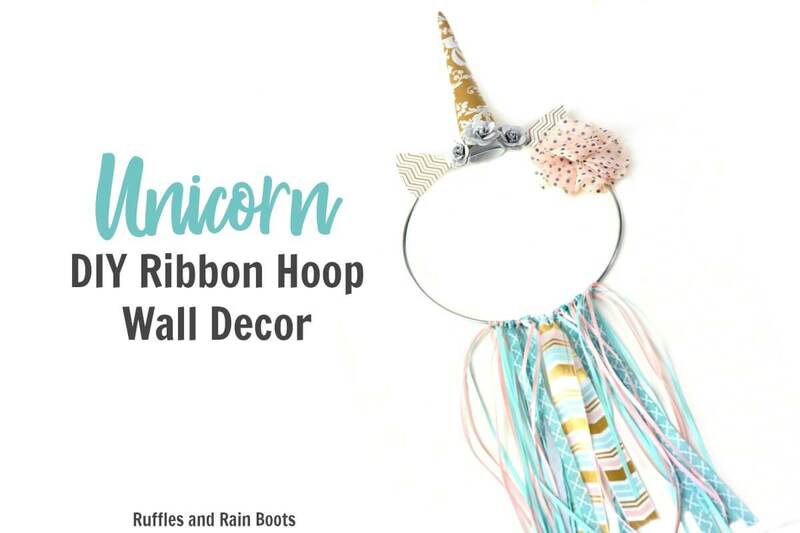 In the center of the hoop, hot glue the unicorn horn to the top-center of the metal (or wooden) craft hoop. You will have to hold in place for a bit while the glue hardens. If any glue shows through, don’t fret – you’ll cover this up with flowers. 2. Create a hanger. Use a thin ribbon (or twine) to create a hanger. Tie the ribbon on either side of the unicorn horn, preferably behind where the ears would go. Hold it up to make sure they’re in the right place and the hoop hangs evenly. 3. Hot glue the ears to the front of the hoop on either side of the horn. Try to make them evenly spaced with just enough room for a flower on either side of the horn. 4. Attach three decorative flowers around the horn (one in front, two on either side). You can choose to add another flower off to the side or not. DIY Unicorn Ribbon Ring Decor - So Cute! You'll have everyone saying, "Awwww, how cute!" about this DIY unicorn ribbon ring! 1. Create a paper cone. Create a paper cone by rolling a corner of the glitter cardstock. This might be tricky depending on the thickness of your cardstock, but work with it. Trim off the rest of the cardstock beyond the cone and use hot glue to secure (you might have to hold it a bit until it sets). Trim the bottom so that it is level-ish (it doesn't have to be perfect) and make any trims or glue adjustments to the tip (if you need to). Set it aside. 1. Attach the cone. 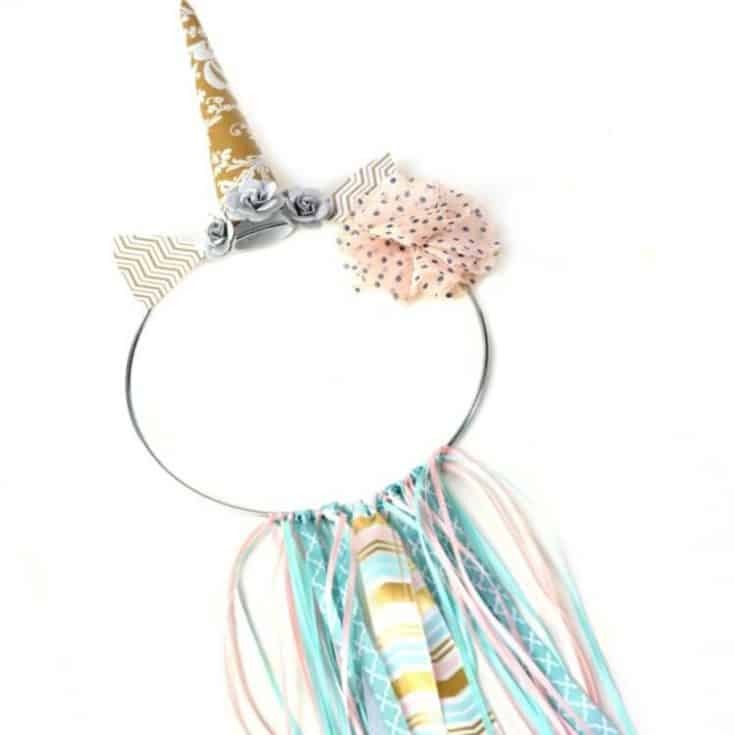 In the center of the hoop, hot glue the unicorn horn to the top-center of the metal (or wooden) craft hoop. You will have to hold in place for a bit while the glue hardens. If any glue shows through, don't fret - you'll cover this up with flowers. 2. Create a hanger. Use a thin ribbon (or twine) to create a hanger. Tie the ribbon on either side of the unicorn horn, preferably behind where the ears would go. Hold it up to make sure they're in the right place and the hoop hangs evenly. Easy, right? This DIY unicorn ribbon ring craft can be done in less than 30-minutes using mostly supplies on-hand. I love easy crafts like this. Who will you make this for? 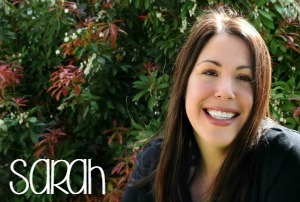 Psst: you can totally answer yourself – I want one of my very own! Please pin this to your favorite unicorn lover board on Pinterest. Your shares are how we grow and we are ever so thankful.